I keep drooling over the new oh so plush, peach stair runner I installed on my stairs this week. Entirely on my own, mind you, AND over the 3 - 4 o’ clock hour when my kiddlings were getting off the bus from school -now THAT is an accessible DIY people. Before beginning, I researched a few different DIY blogs and videos, and put together a plan with my favorite tips and ideas. The entire process was simple, straightforward, and went off without a hitch. I’m so very pumped to share it now with you! A little back story first. The staircase at my front entry was my least favorite part of our fixer upper home when we first bought it. The stairs were covered in high pile beige carpet, the banisters were the sickly orange brown spindle type, and there was a patch of parquet flooring at the base of the steps. So my very first project of the house was to rip up the carpeting and attempt to stain the ratted up pine planks that were installed as the stairs. Y’all, it was not pretty. And it caught dirt like nobody's business. We lived with it for the last few years however, until now. I thought through all different ways to upgrade the stairs without having to tear them out completely, and landed on the art of distraction kind -To lay a dazzling runner up the ugly duckling so that no one will notice her flaws. Oh, it totally works! So without further ado, here is my simple method for laying a runner up your staircase. 1. 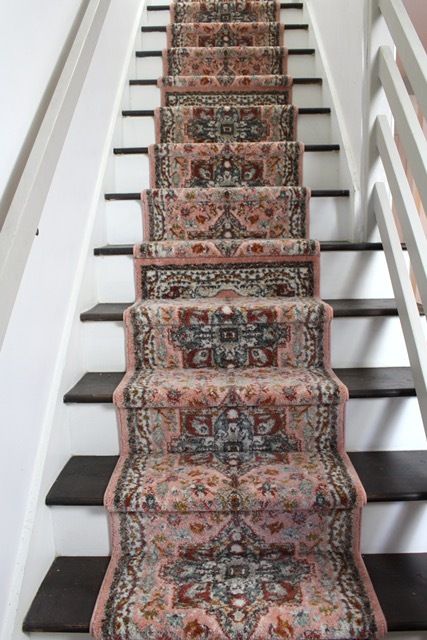 You'll need a carpet runner in the length of your stairs. I wanted a print that would hide as much dirt as possible, and the peach was a perfect match for the rest of my home. 2. You'll need a non slip carpet pad. Some tutorials I read skipped adding the underlayment under the runner, but I wanted a little more cushion for my feet, so I used this cushioned non slip carpet pad. I’m so glad I did! It makes the trip up and down the stairs extra pleasurable. 3. Staple Gun (Here's a link to the one I use, which powers with an air compressor so I needed that as well). 4. You will also need 9/16 inch heavy duty staples, a utility knife, carpet tape, measuring tape, scissors, and a pencil. Your first step is to cut the non slip carpet pad into rectangles, slightly smaller than the width of your rug and the depth of your stairs. We aren’t going to be covering the lip of the step, so it doesn’t need to extend that far. When all of the pieces are cut, find the center of your top stair and mark it on the riser. Then match that with the center of your carpet pad and secure in place with two strips of carpet tape. Once all your underlayment is taped down, you’ll begin to staple down the runner. I started at the top of the stairs, centered the runner, and then attached it to the riser using a strip of carpet tape. Tim cut me a couple 5 1/2" wood blocks to use as jig’s to keep the rug centered on each side as I made my way down so I wouldn’t have to measure every time. They would have worked perfectly the entire time if my stairs didn’t start getting wider the further down the steps I went down - old house problems! But in the beginning it was really helpful to have them keeping everything in place as I stapled the carpet in place. 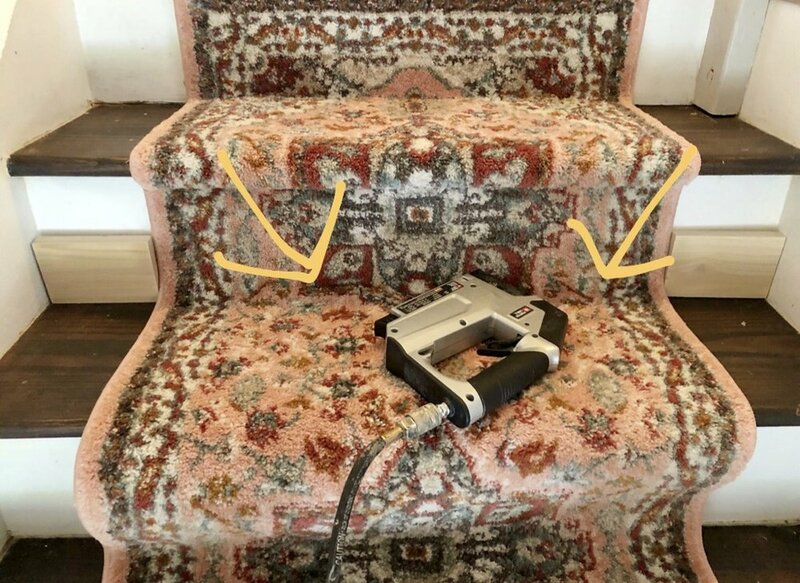 As you go down the stairs, you are going to want to staple at the very base of the step, pull your rug smooth and tight, and then staple under the nose to secure it. These are the least visible spots so attaching them as securely as you are able in those places will give you the most discreet staple job. I found some steps seemed to need more security, so I stapled in other places where needed. Since my rug has a bit of pile to it, the staples hide easily underneath. I was worried it was going to be tricky matching up the different runners, but it honestly was not difficult at all. When I got near the end of a runner I would trim it with a utility knife so it ended under the nose of the stairs and then staple it in place. The carpet tape made it a breeze to secure the next runner in place before I stapled it up, and voila!! The seams look pretty great I’d say! Once you get to the bottom, simply trim to size and staple it down! I’m so glad I added this runner! It definitely works at hiding the dirt between vacuuming, it’s oh so soft under foot, and the whole project took me under 2 hours to complete -that included taking breaks to run down to the bus stop and help with homework. Leave any comments or questions below! I’d love to hear your thoughts! Some products contain affiliate links where I am paid a small percentage if you purchase that item. Thanks ya'll!